Ninety-nine times out of 100, when an automaker tries to make “cars for women,” it comes off as clueless, condescending and just plain bad. Here’s that one time out of 100 when it’s OK, and it comes from a brand that’s forbidden fruit in the U.S. these days. Meet the Daihatsu Sporza Revival line, aimed at custom-conscious Japanese women! I spoke to Daihatsu custom sales specialist Kudou Shinsuke about the whole conceptualization and roll-out of the Sporza Revival (in Japanese, of course, so this is paraphrasing a translation), and he was extremely forthcoming on details. The most interesting to me is that Kudou was very clear that the entire concept behind the Sporza Revival was to appeal to women in Japan. 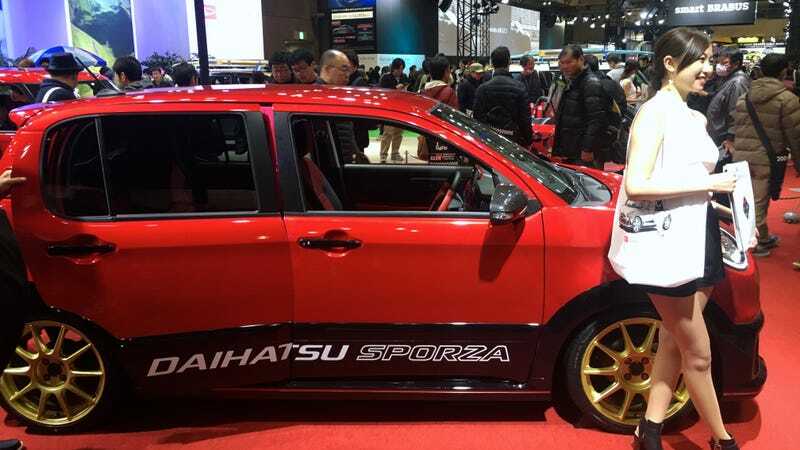 He said that according to Daihatsu’s research, Japanese women are becoming increasingly interested in cars, and increasingly in sporty, modified, customized versions. Japanese women’s participation in the workplace has been making some gains under Prime Minister Abe Shinzo’s “womenomics” initiative, and as more and more women forsake or push off marriage and children, they have more disposable income. Daihatsu is betting on that to coincide with their demographic research showing that Japanese women are joining car culture at a fiscally significant rate. And so, each of the four Sporza models are one-offs built specifically for Tokyo Auto Salon 2017 to show the possible directions she can go with her requests. Second, every Sporza Revival vehicle will be custom built to the buyer’s standards. The platform will be the base models of each of the cars (BOON, THOR, MOVE, COPEN), but you won’t be able to buy a car at Daihatsu and then order the parts for it and have it fitted at the dealership. Instead, you will have to actually work with specialists like Kudou and have it built to your specifications from the ground up. Kudou called this (in English no less!) the “One Person, One Model” concept. Every vehicle will be unique to its buyer, and so every car will be a “model of one.” Pretty damn cool. With the candy apple red paint, black accents, aggressive grills, lips, and side skirts, and hard angled running/city lights, the Sporza Revival line is a welcome departure from the likes of the Honda Fit She’s. Taking women who care about cars at their word that they care about cars? More of this, please.